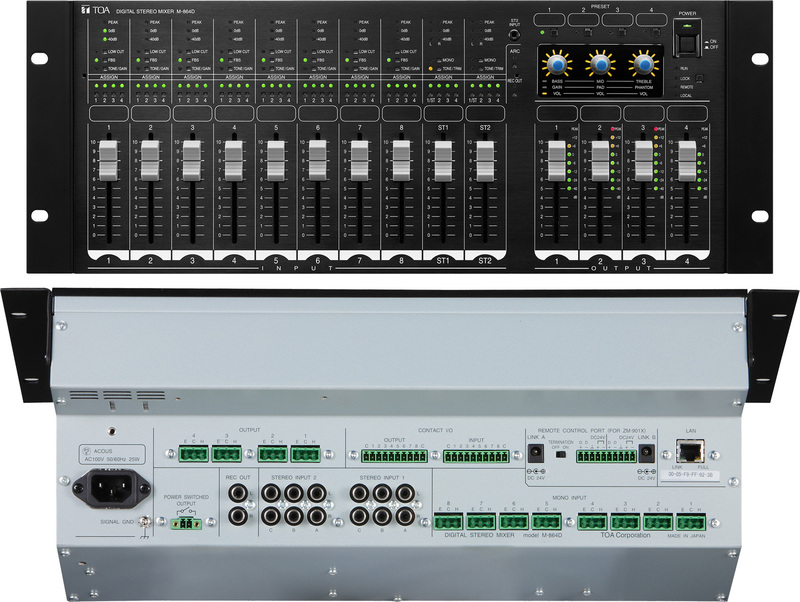 The M-864D is a 4U rack mountable Digital stereo mixer having 15 input channels including 8 monaural input channels and 7 stereo input channels, 6 output channels including 4 monaural output channels and 1 stereo recording output channel, and 4 bus channels. It is equipped with digital signal processing functions such as Automatic resonance control function (ARC(*1)), Feedback suppressor function (FBS), Automatic stereo input mute function (AUTO MUTE or Ducker), and Equalizer. Advanced acoustic compensation can be automatically performed without using an acoustic measuring instrument. 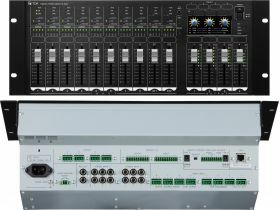 Furnished with various function setting buttons and 14 analog volume faders, the M-864D can be operated without need for use of a PC. However, it can also be operated by connecting the PC or optional Remote control panel. It can be mounted in an EIA component rack (4U size). (*1) Automatic Resonance Control function automatically creates the filter curve to improve sound clarity by measuring the acoustic characteristics inherent in architectural space. Note: In daisy chain wiring, the number of units differs depending on the cable length. Star wiring and daisy chain wiring cannot be used together. 482.6 (W) × 177.1 (H) × 157.2 (D) mm (19 × 6.97" × 6.19")"
*Windows is a registered trademark or trademark of Microsoft Corporation in the United States and/or other countries. *Pentium is a trademark of Intel Corporation.